TSM will face the winner of tomorow’s match between FlyQuest and Team Liquid in the LCS finals. In 2018, TSM failed to qualify for an LCS playoff final for the first time in the organization’s history. Now, one year later, TSM are heading to St. Louis in their long-awaited LCS finals return. 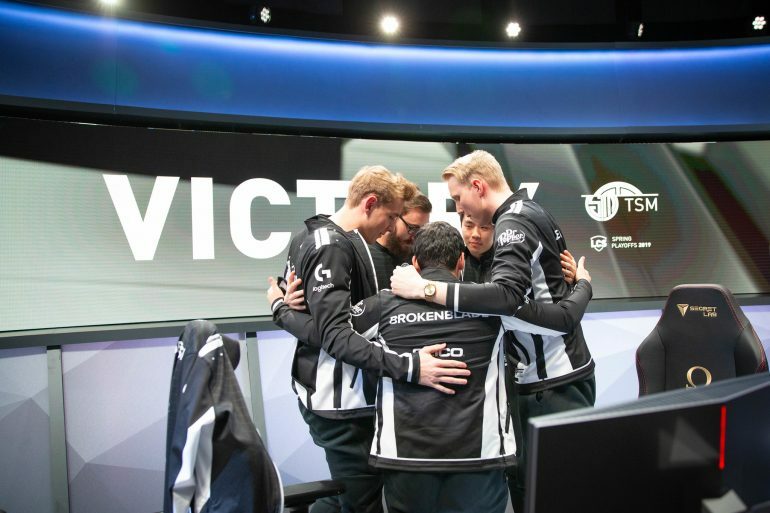 In a grueling five-game series, TSM pulled off a magical reverse sweep against longtime rivals Cloud9 to become the first team to qualify for the 2019 LCS Spring Split finals. Playing Alistar, Galio, and Braum in TSM’s three wins, Smoothie was crucial in both starting fights for TSM, as well as protecting his teammates from enemy crowd control. Smoothie had an MVP-level performance in game five as Braum. He not only found picks onto C9’s carries multiple times, but also routinely blocked C9 top laner Eric “Licorice” Ritchie’s Ornn ultimates. But the man awarded MVP of the series was none other than TSM’s marquee player, mid laner Søren “Bjergsen” Bjerg. In his 100th playoff game, Bjergsen led TSM to their first win of the series with an otherworldly performance as Akali. But despite winning multiple domestic titles, Bjergsen revealed that he also still feels nervous at times. In poetic fashion, TSM ended Cloud9’s playoff run with Kindred and Zilean, a composition C9 popularized in 2018. Now heading into the finals, TSM predict the veterans of Team Liquid will beat FlyQuest in tomorrow’s second semifinal series. “I think I can’t say who we’ll be facing but I think most likely due to how long the players on Team Liquid have played, and how comfortable they are in these high pressure situations, I think that they’ll take the series,” Bjergsen said. Team Liquid will try to make TSM’s prediction a reality when they face FlyQuest tomorrow.